Can we say “Welcome Spring!” How I love it! Doesn’t it automatically cause you to think of family grill outs, planting your gardens, riding bikes, the coolness of the mornings… oh I just love it! Well part of our spring consists of revamping… you ask, what are you revamping? Anything and everything! We see it as the season of refurbishing! Below is our newest re-furbished piece… hope you enjoy! Cable drums are used mostly for hauling large amounts of cable wire. They are hard to find apart from inside electric companies and such. On the other hand, you may get lucky and find one at a scrap yard or a dump site. If you do find one… don’t let it get away! You can find many uses for them! They come in all sorts of sizes, which makes it perfect for different projects! For instance… a friend of ours found 2 and gave us one! 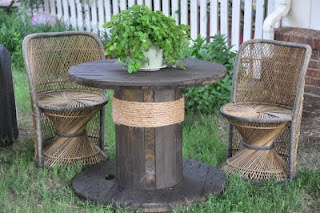 We decided to make ours into outdoor patio furniture! It was easy, fun, and it looks great! 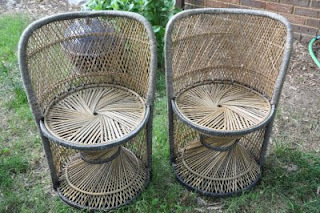 * Patio Chairs- ours were a yard sale find for $2 each! * First of all clean off the cable drum, make sure there is no oil or dirt on it. * Secondly, sand down any rough spots or edges, you could use your hand to sand and a grit paper 100. 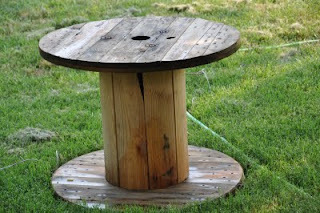 * Thirdly, Stain your cable drum. * Allow stain to dry. * Add final touches by wrapping the rope around the base of the drum. * Lastly, find matching chairs. Like I said, we found some at a yard sale for $4 total! Keep your eye open for those good deals! They are far and between! We added our $2 plant to the table and I just love the feel it gives! How good it is to know that He owns it all. May we not forget today that HE is the author and finisher of our race and has the authority to do so, HE created us! Amen and Amen.